The service comes in 3 simple plans starting with the free Lite plan, followed by the Professional and Teams plan. Larger enterprises can also contact their sales department for customized large scale service options. 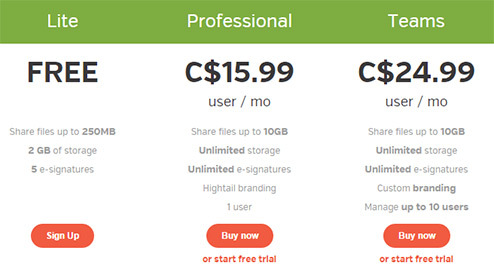 The free Lite plan provides 2GB of storage, file size limit of 250MB and up to 5 e-signatures. Features are also limited, but the Professional plan at $15.99 pretty much unlocks everything, including unlimited storage and e-signatures, with the single limitation of being designed for one user only. The final Teams plan allows for up to 10 users and custom branding. Encryption is used on the cloud server, as well as during file transfers for layered and dependable security. Hightail uses 256-bit AES encryption on all stored drives, and 128-bit SSL encryption protocol during all file transfers. However, the service takes it to another level with additional features that can be used as reliable security failsafe solutions when sending sensitive data. Users can apply E-Signature (electronic signature) identity verification requirements for the recipient to positively ID themselves before getting access to the data. The recipient would be required to digital sign with his mouse or finger when using a mobile touch screen, before getting the green light for file delivery. In the same fashion, password protection can be applied to the files, as well as expiry dates that automatically delete the file’s shared link. Lastly, but very notably, file tracking logs are also available. To test Hightail, I uploaded a video file that was 135MB, and it only took 42 minutes to complete. That may not sound like the fastest service, but please understand that I am on an Internet connection with 5Mbps download and 1 Mbps upload bandwidth. Because all of the speed tests used the same Internet connection, we can objectively benchmark the speeds of different services. They were slower than most of the other services I have tested. And though I thought that the speed was a result of purely my Internet connection, I was also disappointed to discover that download transfers were also slow, even though I have 5 times more download bandwidth than upload. The service does not offer any specific features designed towards automated backups. 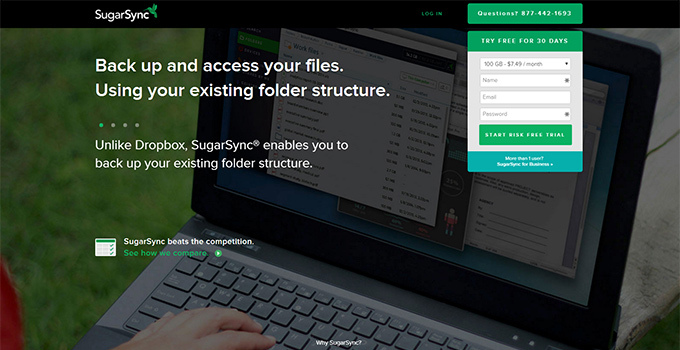 It operates similar to popular services such as DropBox, by synchronizing files on the cloud folder to all shared devices, ensuring that the latest version of updated files are available to all users. However, automated backups would have to be manually configured without the help of the software. The good news is that the unlimited storage plans allow for larger quantities of data to be kept, with a respectable max file size. Unfortunately Hightail lacks the essential support for file restoration. This means that you can’t really restore any deleted files. 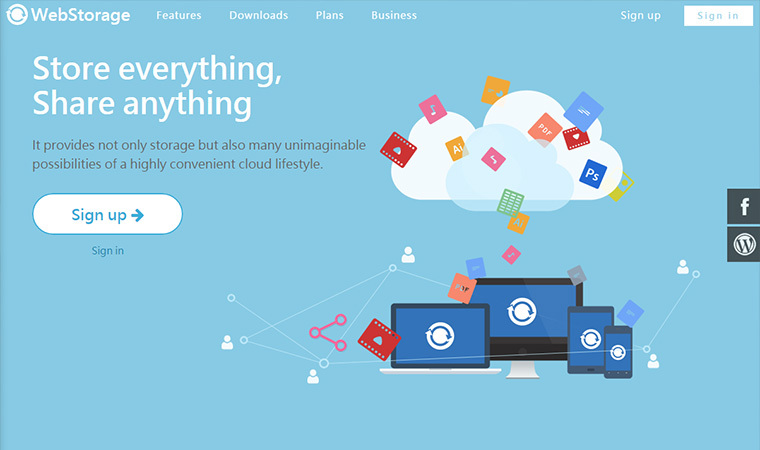 As with any cloud providers, your data is redundantly kept on the server in order to minimize data loss, but due to not being a backup focused service, it may be best not to fully depend on their service as your sole storage solution, but rather the file sharing and collaboration service it is designed to be. They offer videos, an extensive knowledge base, FAQ, and a ticket system that allows you to get help with any issues you may encounter. They also have a community section with feedback from Hightail employees, but I did not find it exceptionally helpful to my questions. Response time was not the fastest, but support was courteous. Overall, the service they offer is great for sharing large files among friends or colleagues. Work projects to tend to be more of a focus, with the e-signature feature being useful for sensitive documents. However, for the cost of the service, the unlimited storage is the biggest attraction, due to lacking on functions such as file restoration, versioning, and other backup friendly options. The mobile apps we’re adequate but not as fluid as the desktop software. 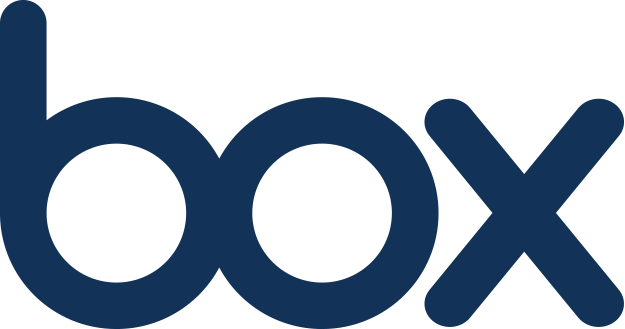 In the end, if you’re looking for a drag and drop service similar to DropBox, but with better security, Hightail is a considerable option.